For many of us our pet is our first baby. He/She has had your undivided attention for probably a few years. They may be used to having the run of the house, cuddles on the sofa and probably know exactly how to get your attention. A new baby not only changes your life but also really affects your pet. When we were expecting Piglet I was a little worried about how our dog Rodney would react. We took a number of precautions and in the end it turned out we had nothing to worry about. Start early. If you’re going to make any major changes you should do it as soon as you find out you are pregnant. In our case, we stopped letting Rodney on to the sofa. This way your pet will not associate the disruption to their routine with a small screaming “thing” thats just come into their house. Create a safe haven. Rodney had originally been crate trained, but he had come out of it before Piglet was on the scene. We reintroduced the crate while I was pregnant and I’m so glad we did. It is somewhere Rodney is able to go away from the noise and inevitable visitors and get some down time. As we changed the rules around the sofa Rodney now opts to sit in the other room in his crate (with the door open) of an evening rather than sit in the living room with us. He has not been pushed out – it is purely his choice. Introduce new objects before the baby arrives. Around a month before I was due to have Piglet we set up his moses basket in the living room. The purpose was to stop it being too much change all at once. Rodney was accustomed to the moses so when Piglet arrived and was placed in it the novelty had already worn off. Make care arrangements. 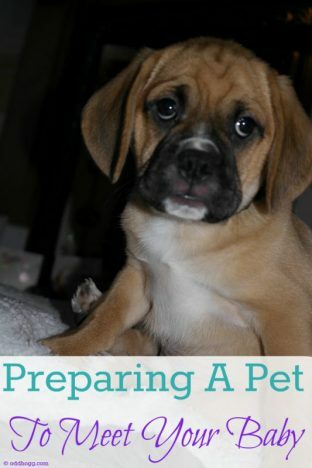 Labour is not often a quick process, so arrangements will need to be made to make sure your pet is looked after. Its not easy when you don’t know when you’ll go into labour but most people will be willing to be flexible if they’re helping you out. I also had some lovely friends help out with walking Rodney once I was home with Piglet to make my life a little easier and make sure his routine wasn’t disturbed. Smell before meeting. We took a muslin that Piglet had been lying on home for Rodney to sniff before Piglet came home from the hospital. It is a bit like humans putting a face to a name, once Piglet was in the door he was able to recognise the smell. If you’re on the ball you can also give treats as they sniff the object, meaning they will associate that scent with good things. Control the introduction. Do not let your pet get too close to the baby. You should maintain a distance between them so that they learn to respect a boundary around the baby. Be sure not to discourage curiosity though, its ok for them to want to know whats going on. It should just be carried out in a calm and controlled manner. Don’t forget your pet. In the excitement of a new baby and lots of visitors its easy for them to get lost in the scuffle. We made sure Rodney was receiving lots of praise and extra things to keep him entertained. To avoid over excitement we opted to keep him separated from most of the visitors, only bringing him through to see those we knew he loved. Enjoy it. A bond between a child and their pet can be incredibly strong. With guidance and supervision they can be great friends. Note: No matter how placid you believe your pet to be it is not advised to leave them unattended with a baby or child. Children are unpredictable and can easily frighten a pet, resulting in injury. Always err on the side of caution. This post was originally shared over on Nap Time Natter. This brought back so many memories as we had a cat when Caspian was born. I have the cutest video of their first meeting. But he got run over last September and it’s still really painful. Great tips though. 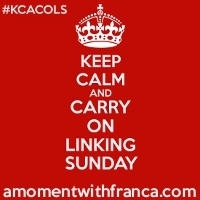 Thanks for sharing with #KCACOLS Hope you’ll be back next Sunday. haha! cute that did that – I bet he steered clear of the others! I’ve never heard of that – would have been useful before Piglet came along! For me it was totally worth the effort that went into prepping him for Piglets arrival, it means he wasn’t negatively affected byt he addition! There are some really fab tips here. Kimberly. Only problem is, you’ve set me off again wanting a dog!! Absolutely! I am constantly frustrated by the number of children that pat Rodney without asking. He’s friendly but they don’t know that!